Italian author; born at Acqui Nov. 7, 1820; died Oct. 5, 1883, at Alessandria, Piedmont, where he had resided since 1848. He was an ardent patriot, and maintained a correspondence with D'Azeglio, Bianchi-Giovini, Balbo, and Gioberti. Being very wealthy, he devoted all his energies to the elevation of the poorer classes of Alessandria, making his philanthropic plans known both through the daily press and by means of his own writings. 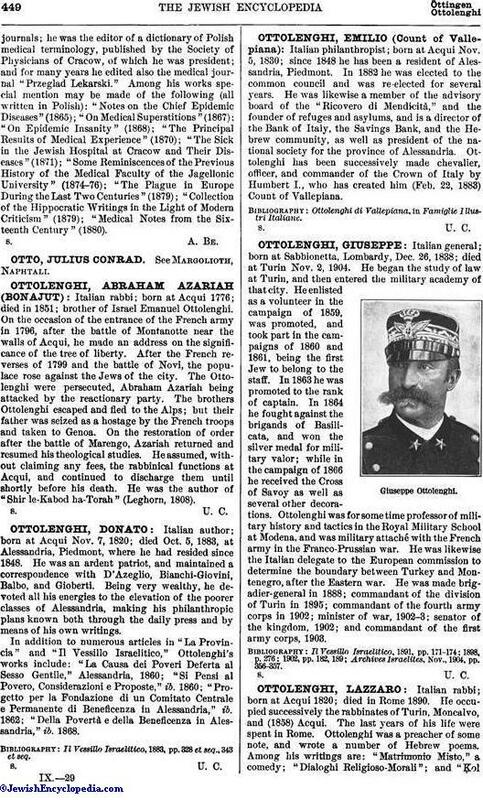 In addition to numerous articles in "La Provincia" and "Il Vessillo Israelitico," Ottolenghi's works include: "La Causa dei Poveri Deferta al Sesso Gentile," Alessandria, 1860; "Si Pensi al Povero, Considerazioni e Proposte," ib. 1860; "Progetto per la Fondazione di un Comitato Centrale e Permanente di Beneficenza in Alessandria," ib. 1862; "Della Povertà e della Beneficenza in Alessandria," ib. 1868. Il Vessillo Israelitico, 1883, pp. 328 et seq., 343 et seq.